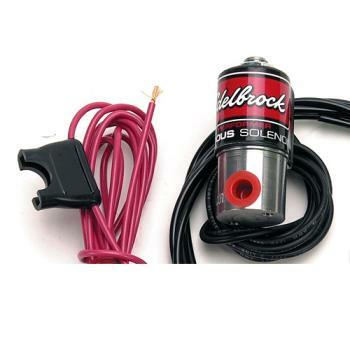 Designed for Edelbrock nitrous systems, these stainless steel solenoids have a very low amp draw. They feature a stainless steel base for corrosion resistance and tighter tolerances, a low current-consumption coil, a Teflon® plunger for reliability and longevity, and a powder-coated coil cover for durability and appearance. The Victor Pro nitrous solenoid is perfect for racers because the bottom outlet design restricts flow much less then a standard design solenoid. This feature, combined with a .115” internally drilled metering orifice, make this our highest flowing nitrous solenoid. The Victor Pro fuel solenoid features a shorter body with a smaller diameter stainless steel base for use where space is limited. An important note about Amp Draw: All ratings listed below are under a load condition (For example: 950 PSI nitrous and a minimum of 6 PSI fuel pressure). Please note that other manufacturers may list amp draw under a “no load” condition which, is not realistic.